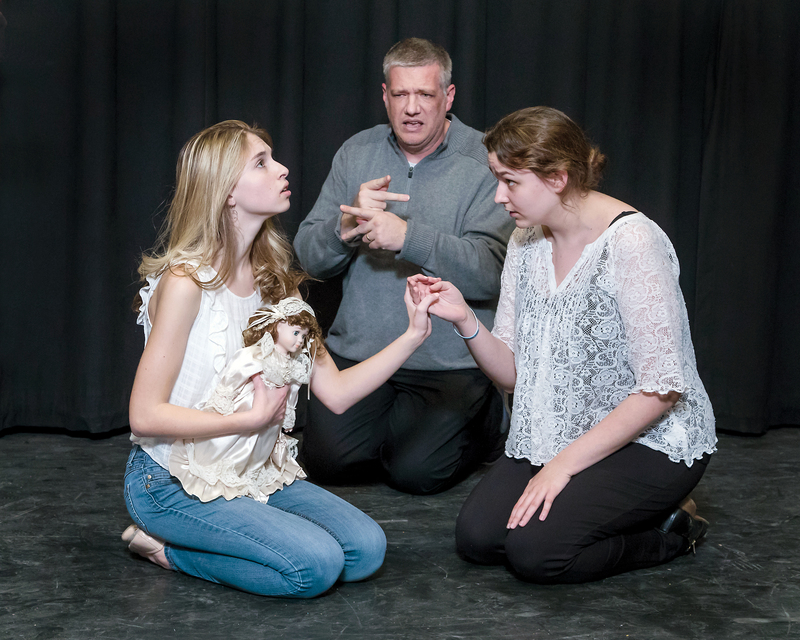 Payton Miller, left, as Helen Keller and Madison Roush, right, as Anne Sullivan work a scene from The Miracle Worker with Paul Fugate, an ASL interpreter. Photo by Brett Hardy. Based on the true story of Helen Keller and her teacher, Anne Sullivan, William Gibson’s play opened on Broadway in 1959, featuring Patty Duke as Keller and Anne Bancroft as Sullivan. As a toddler, Keller lost her vision and hearing, which led to raging tantrums that traumatized her family. Anne Sullivan moved in with the Kellers and taught Helen to communicate using hand signs. The film adaptation of The Miracle Worker was released in 1962, with Bancroft and Duke reprising their roles — both actresses won Academy Awards. Gibson received an Oscar nomination for his screenplay, having won a Tony for his play, which has been produced countless times in high school, professional, and community theatres. As Caporuscio began planning, she felt that the show would be a special production — emotional, dramatic, and engaging for people who have never before been inside Armada’s theatre. Instead of a more naturalistic set showcasing the detailed interior of the Keller home, Caporuscio imagined a minimal, more stripped down and abstract design with a monochromatic color scheme and platforms rising from upstage center. On top of the highest level, at the heart of the production, Caporuscio decided to add two American Sign Language interpreters. Present throughout the show and dressed in period clothing, the pair will interpret the entire show in all of Armada’s performances, making the shows accessible to audience members who are deaf or hard of hearing. A video feed of the interpreters will be projected in the house. Caporuscio reached out to Paul Fugate, an ASL instructor and interpreter who teaches in a nearby school system, Romeo. Fugate, who has made his career in ASL, began his journey almost 30 years ago. As a teenager, he regularly encountered a young man who never responded when Fugate said hello. After discovering the man was deaf, Fugate decided to learn how to communicate with him. To prepare to interpret plays, Fugate will spend time with the script: reading and rereading. For a production of Much Ado About Nothing, Fugate estimates he spent almost 100 hours translating Shakespeare’s language into contemporary speech and then into ASL. Fugate is currently preparing three of his most advanced high school students to interpret Armada’s Miracle Worker. 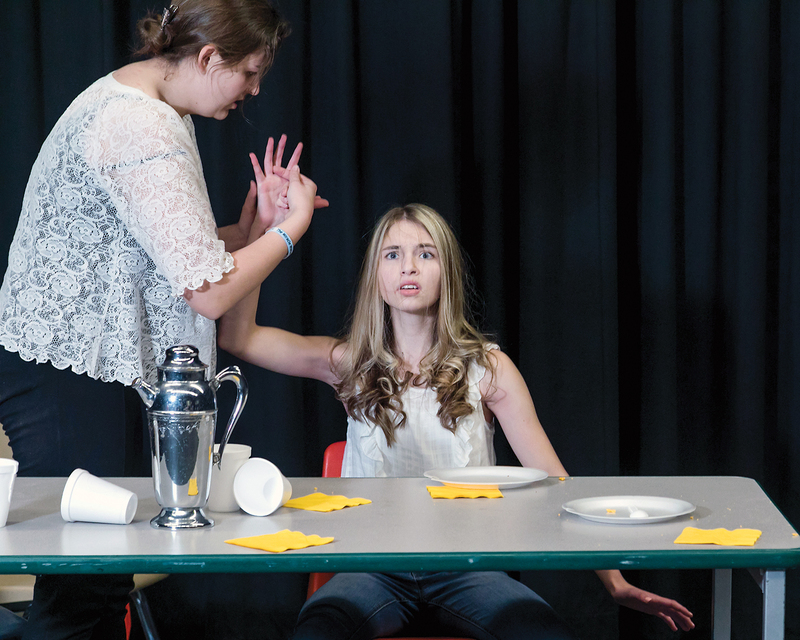 Roush and Miller in rehearsal for The Miracle Worker. Photo by Brett Hardy. Caporuscio hopes to continue learning and experimenting so that Armada’s productions are accessible to a wide variety of audiences. The Miracle Worker has provided complex roles for her students and valuable opportunities for her program to engage new partners and cultivate new ways to share the magic of theatre.